Life in South Florida engenders a certain skepticism. Perhaps, it comes from watching too many young women park Italian sports cars in handicap spaces, hang placards of questionable provenance on rear view mirrors, emerge effortlessly from low-slung cars that able-bodied me couldn’t escape without the assistance of a forklift, then stride purposefully away on six-inch stilettos. Without a hint of impairment. A wiggle, maybe, but no damn limp. 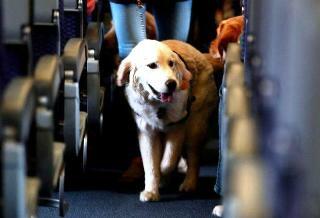 South Floridians suspect that the cute doggies hauled into stores, planes and restaurants are household pets passed off as “certified” emotional support animals, writes Sun Sentinel Columnist Fred Grimm.